Season Three of the electrifying, award-winning series finds the Gleeks headed for the Nationals - and graduation! As younger members join New Directions, others are about to begin exciting, if uncertain, lives outside it. Featuring some of television's most enthralling song and dance numbers, including memorable hits from the legendary Michael Jackson. The hit half-hour comedy sketch series—executive produced by Emmy-Award winning Allan McKeown Presents—stars the British comedienne in a variety of guises as she pokes fun at American people in an irreverent and truly original way. Her mimicry and flair for impersonation makes Season #3 the most ambitious season of the series so far as Ullman inhabits 60 different characters—original creations as well as Arianna Huffington, Barney Frank, Rachel Maddow, Matthew McConaughey, Susan Boyle and many others—in her hilarious tour across the U.S.A. Premiere Props announce that they will be auctioning iconic Hollywood memorabilia on Saturday, July 30 and Sunday, July 31 at their headquarters in El Segundo, CA. There will be a preview from 9-11am PT with the live auction beginning at 11am PT. 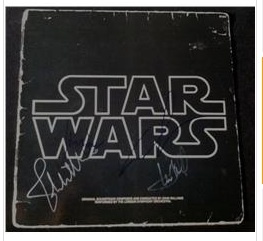 Includes items from Michael Jackson, Star Wars, Planet of the Apes, Batman and more.